Vermont can be the state in which you discover an ancient form of relaxation called Yoga. 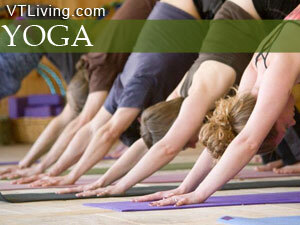 There are Yoga Centers and Meditation Centers in Vermont than can introduce you to this form of exercise. There are many different types of yoga. Read more about Vermont yoga, reiki, and healing centers. Consider a life-altering, healthful vacation in Vermont. Ask your resort, hotel or innkeeper about Yoga instructors nearby. Ask us about Yoga Studios or share healthy living comments. To feature your business, contact us. Roll out your mat and join the YOGA revolution. September is National Yoga Month – a good time to try some Yoga exercises and postures. There are dozens of free Yoga classes and events available. The average price of a paid yoga class is only 12 dollars, so working with an experienced Yoga instructor is quite affordable. Yoga is growing in popularity. Nearly 16 million Americans practice yoga, most of them women. The typical yoga practitioner claims better relaxation and overall health. Yoga is not without risk, however. There were more than 5,500 yoga-related injuries last year. Yoga is centuries old. In India, they have been practicing yoga for more 5,000 years. Some Vermont inns, hotels and resorts offer Yoga lessons or can arrange for you to meet with an independent Yoga instructor during your visit. The Vermont landscape is conducive to relaxation, so the combination of Vermont vacation with yoga lessons is a terrific match.